This cemetery was at the site of an old grist mill near White Rock Creek on the Lanson Clark headright. Collin County deed records call him "Lawson Clark." Plano, Texas: The Early Years says that the cemetery is south of Yeary Road. Until a few years ago Parker Road west of Preston Road was called Yeary Road. 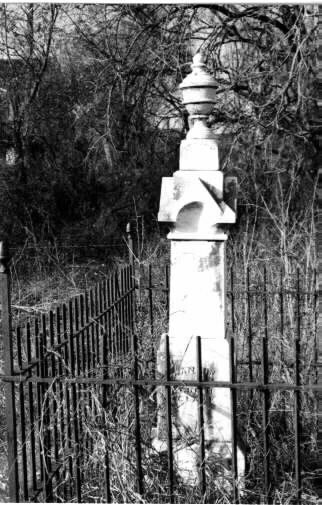 The Clark Cemetery was surrounded by a 4-foot wrought-iron fence. It was very small, maybe 8 feet square. There was one 6-foot obelisk for Lanson Clark and his wife. It is one of the oldest stones in Plano, dating back to February 1847. The Baccus and Young Cemeteries have stones of approximately the same date. Lanson Clark is mentioned in numerous histories. His first name is usually wrong. He is credited with starting and naming Lebanon. This cemetery is neglected. The enclosed area is full of weeds and briars. The stone looks as if it is in good condition. A search of deed records did not find the cemetery deeded. Cemeteries of Collin County, Texas, by Joy Gough.